2015 saw me transition from a 3,000 square foot home in on a 3 acre farm to a 300 square foot studio apartment in downtown Seattle, Washington. Unlike a tiny house, where architectural elements are used to create nooks and crannies that conveniently hide clutter and tidy the space, a studio apartment (like a dorm room) has a unique challenge: open floor space. My space, a single room with a bathroom on one side and a tiny kitchen on the other, offered a clawfoot bathtub, high ceilings, and a view of the Puget Sound- but offered little by way of storage space. 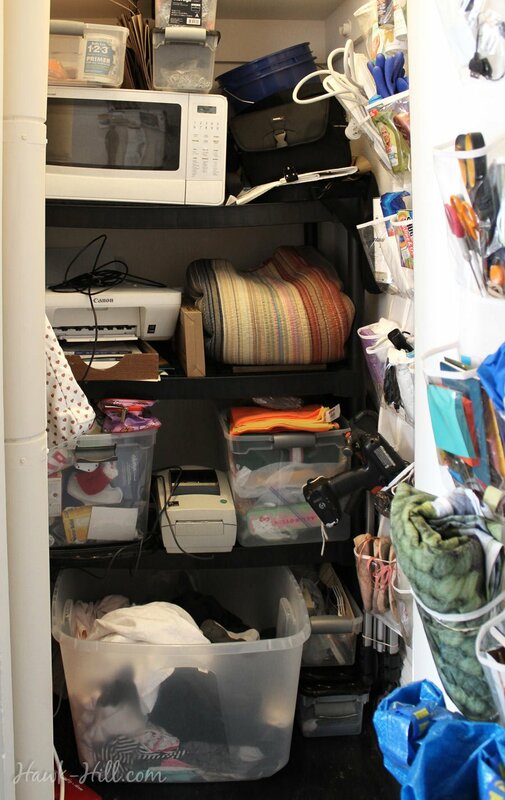 One small closet, a shelf, a small, glass-front kitchen cabinet, and a tiny medicine cabinet in the bathroom were the only storage available in my little studio apartment. Transferring my style from a large house to a studio apartment took creativity, bargain shopping for the right supplies, and more than a little grief in regards to willingness to say goodbye to most of my possessions. Without further intro, here are the 4 rules I live by in my studio apartment that keep my tiny living space stylish, open, and uncluttered. If you are moving into a studio or have lived in a studio apartment long, you’ve likely already paired your belongings down to the bare essentials. You know what you can’t live without and what your essential living supplies are- and the reality is that not all of the essentials are pleasant to look at. When possible, I try to buy essentials that are pleasant to look at (like, for example, using wood hangers instead of wire or plastic hangers in an open closet) but certain essentials, like printers and microwaves and the 2-3 plastic storage containers we ALL have are, simply, ugly. When I moved to my tiny studio, I identified the objects I couldn’t handle looking at and decided to yield my tiny closet to hide these unaesthetic beasts. Instead of using my closet for clothes, I installed a utility shelving unit and relocated unredeemable ugly stuff to this small, concealed area and placed my clothing in an open closet in my entry hall. Storage ottomans and bedframes with storage seem to be the go-to for providing storage in an otherwise open space, but when living in a tiny studio apartment or a teeny-tiny dorm room it can be helpful to go a step further- planning decor around objects that can be used as storage. 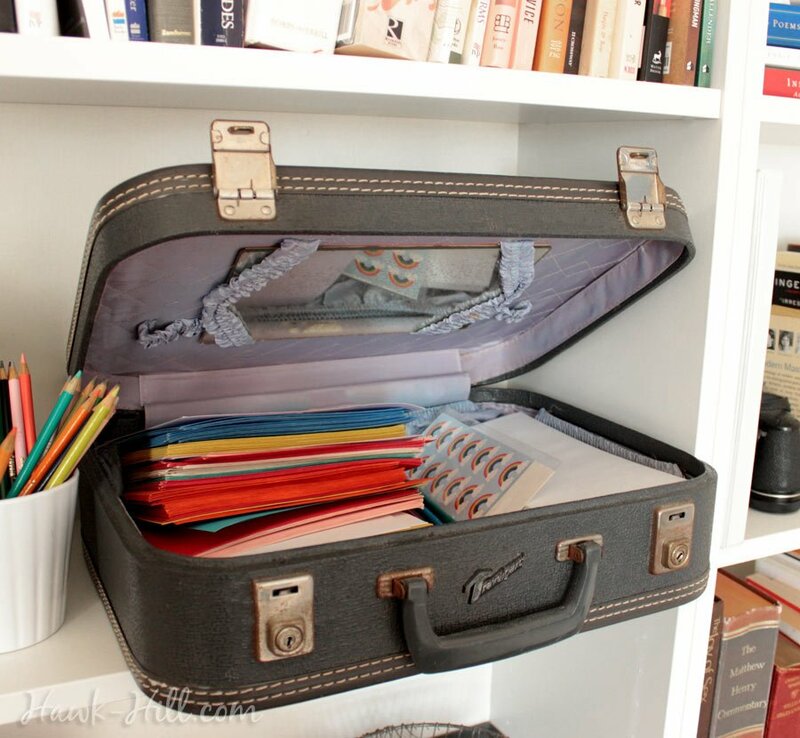 Here, a small vintage suitcase holds envelopes and stationary without adding clutter. 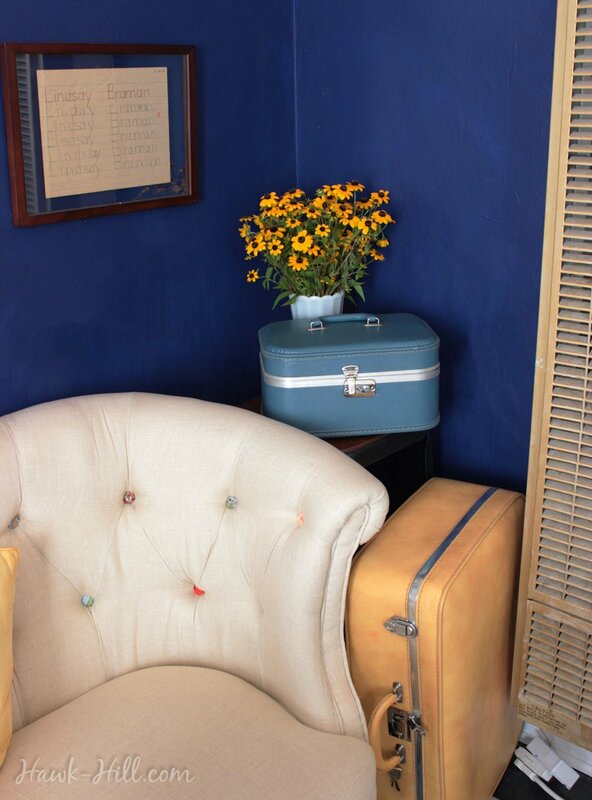 In my little studio apartment, I decorate with vintage suitcases and train cases. 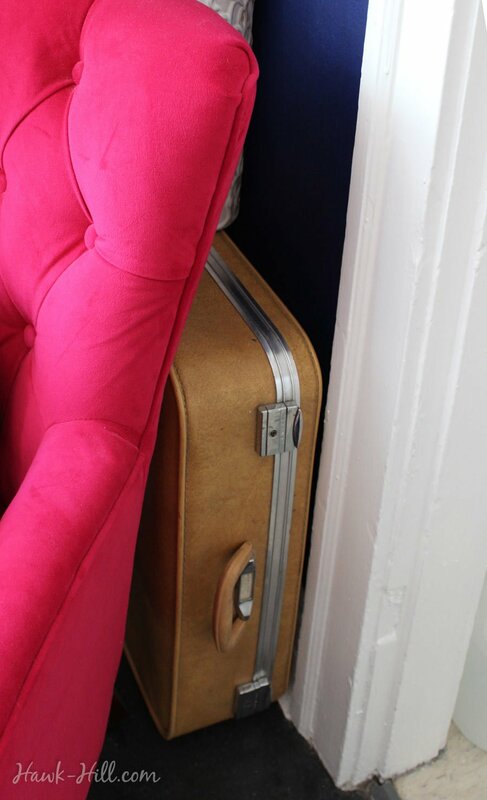 Tucked behind chairs, on shelves, and around corners, these suitcases provide style and storage. The suitcases, in particular, feel appropriate for decorating my space during this season of my life. 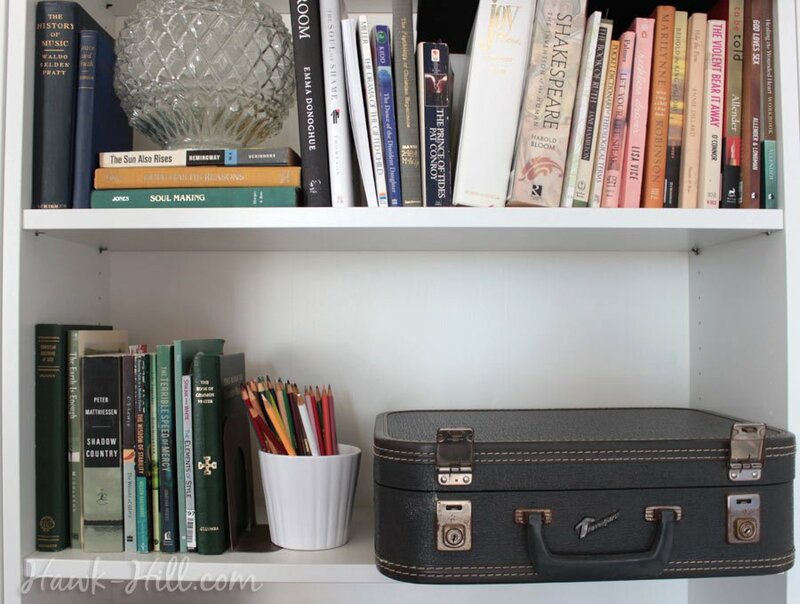 A place of transition as I move between a career in business to a career in a healing, creative space, the suitcases serve a bit of a reminder that this is a season of travel- not in regards to geography but in regards to my own vocational and personal journey. 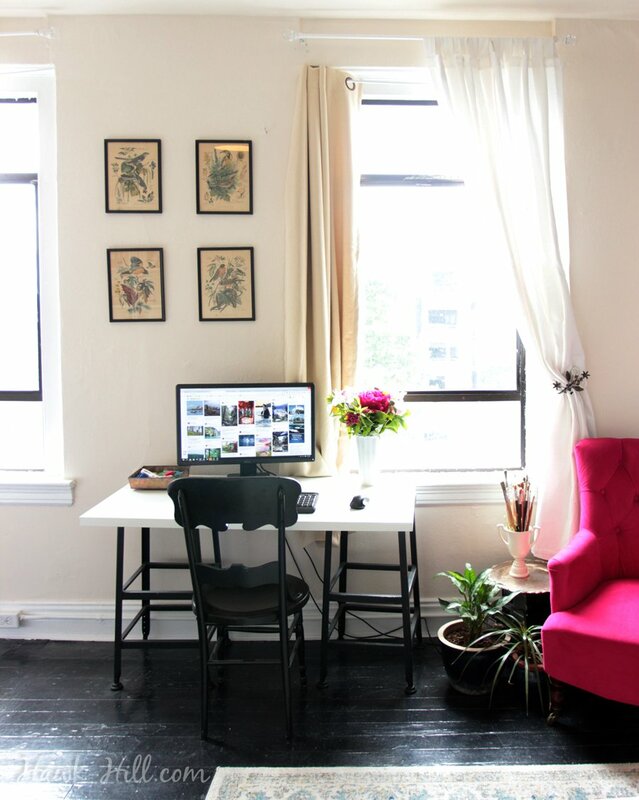 My 3rd rule for making a dorm or tiny apartment stylish is repackage, repackage, repackage. Whether open kitchen shelving, bath and beauty products, or office supplies- replacing product packaging with simple, themed containers makes a massive difference. Back home in my big house, I did this in my art studio with a collection of white planters. In my apartment, hinge top jars provide airtight storage for everything from oatmeal to contact lenses, spare change to make up remover. 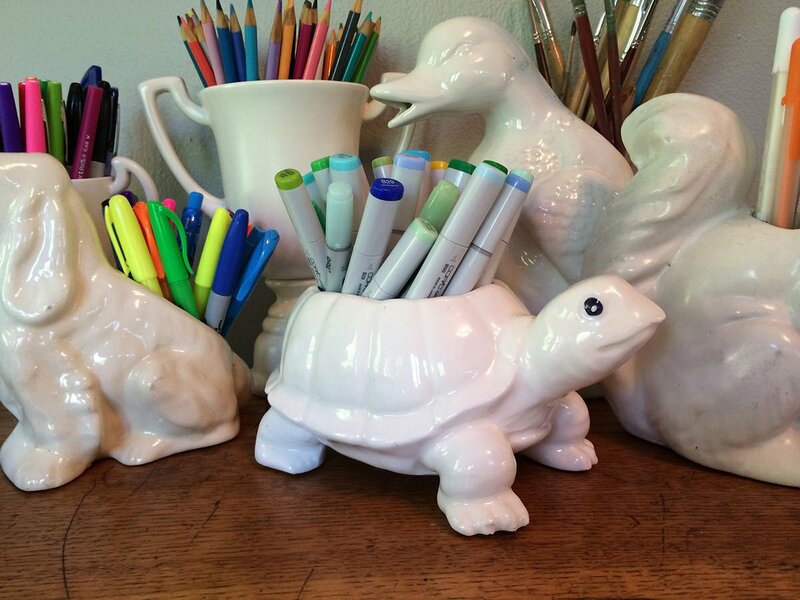 Planters to hold art supplies were a staple in my art studio in the midwest, now that I live in 300 square feet, I use the same method- displaying utilitarian items- to craft an organized studio. 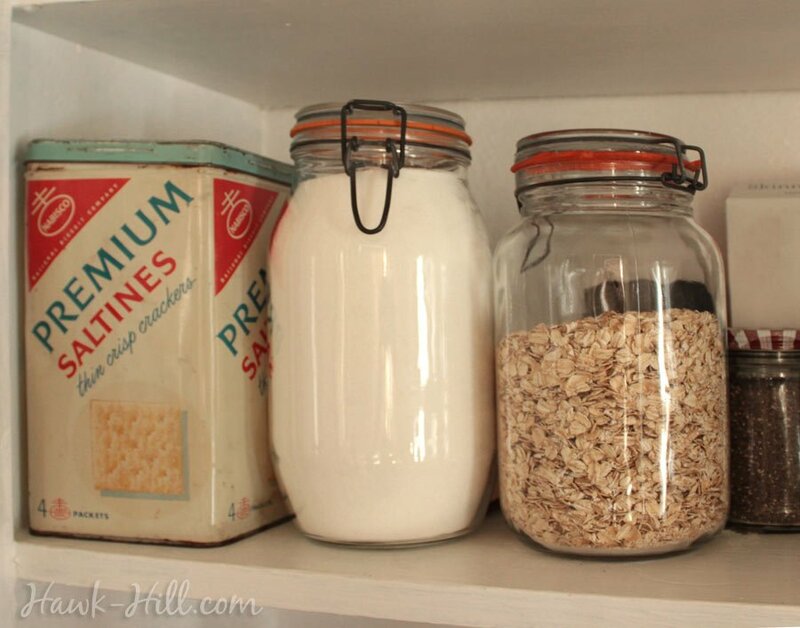 Pantry staples like crackers, flour, and oatmeal become part of the decor (and last longer!) when repackaged into vintage hinge top jars. These half gallon size jars usually sell for $1-$4 at thrift stores. Product Packaging is designed with the ultimate goal of making you purchase a product, not of looking great in your space- so when living in an area that doesn’t allow the option of hiding your stuff, it helps to shed the packaging for simple packaging the displays the contents beautifully. Even lotion and mouthwash can become stylish to display openly if decanted into a soap dispenser or a vintage whiskey decanter, respectively. 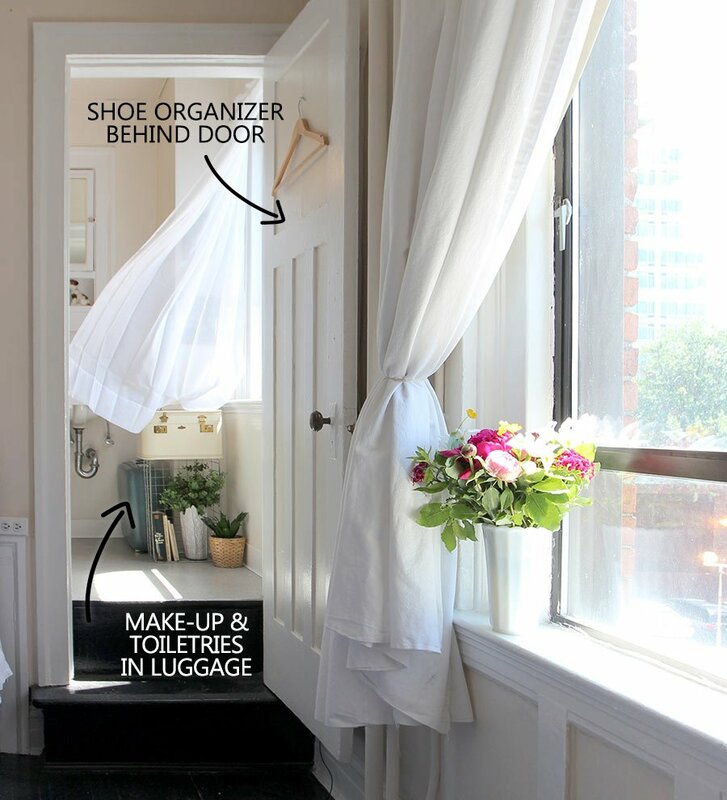 Definitely, definitely look exclusively for the clear shoe organizers for this. When I first tried this trick I used white fabric shoe organizers from Ikea and thought labeling them well would be sufficient but it definitely wasn’t. The switch to clear pockets is what made these work so well that after trying one I ordered 2 more immediately. 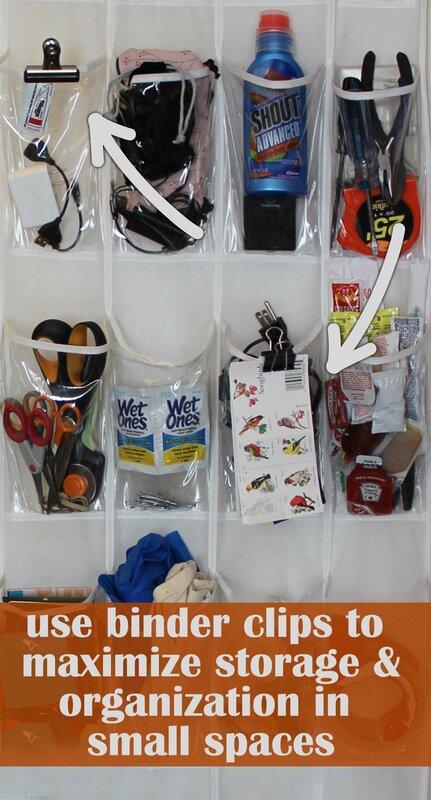 Shoe organizers can be used over the door or hooked onto screws that are drilled into wall studs. 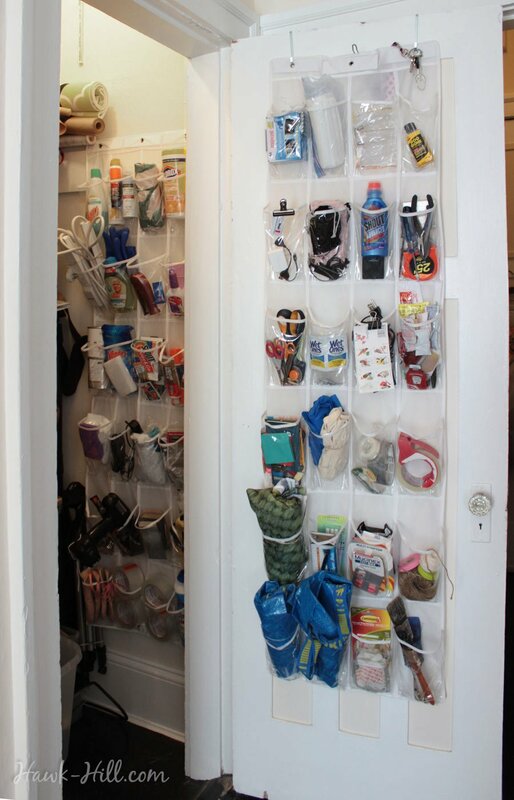 I put shoe organizers anywhere that’s hidden- behind doors and on the interior walls of my closet. I don’t like the over-the-door hooks they include, but have had success simply placing screws in the wall from which to hang the top grommets of the organizers. 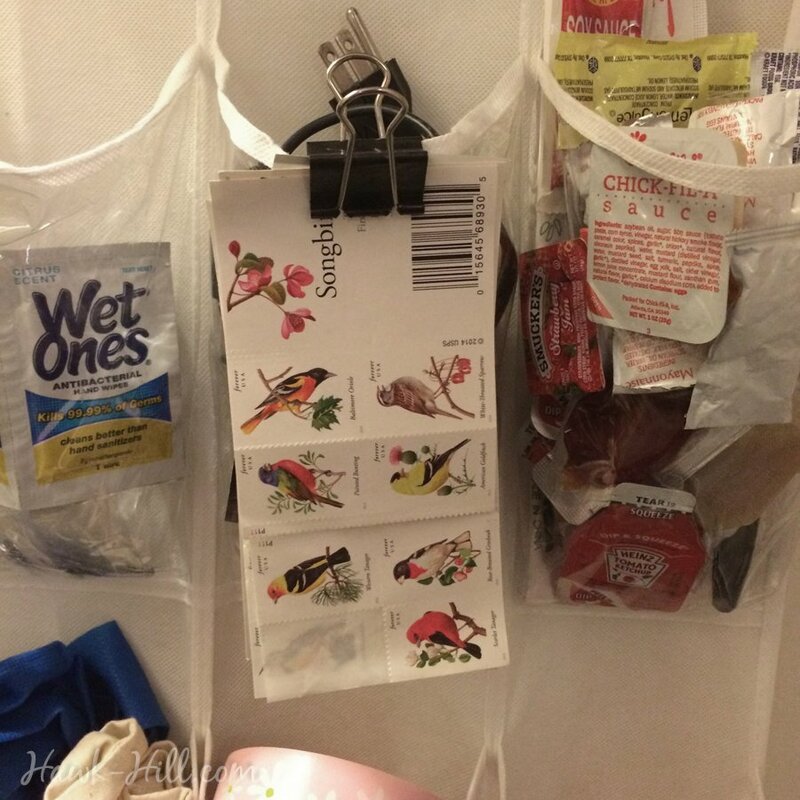 I soon figured out there was a way to get even more storage out of these shoe organizers: using binder clips to attach flat odds and ends like stamps or membership cards. Extra binder clips help keep easy-to-loose paper items close at hand and easy to find.